Sometimes it's difficult to get excited about complexion products. Eyeshadows and lipsticks - those have colour and whimsy and drama. Complexion products tend to be those workhorses that go under-appreciated. Let's have a look at this latest beauty, yes? 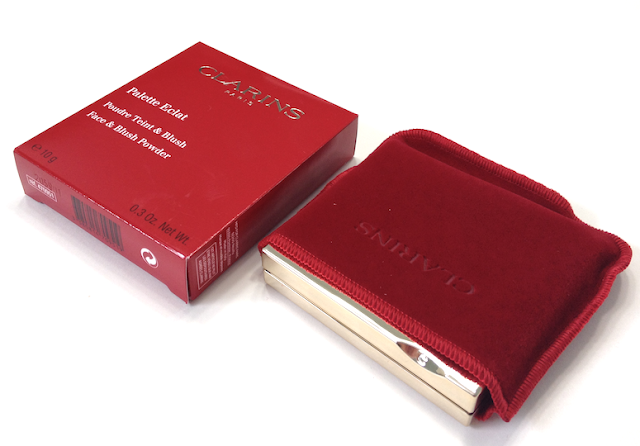 The scarlet and gold external packaging is bright, classic and elegant, and immediately French-feeling to me. Look at that gorgeous iris detailing! 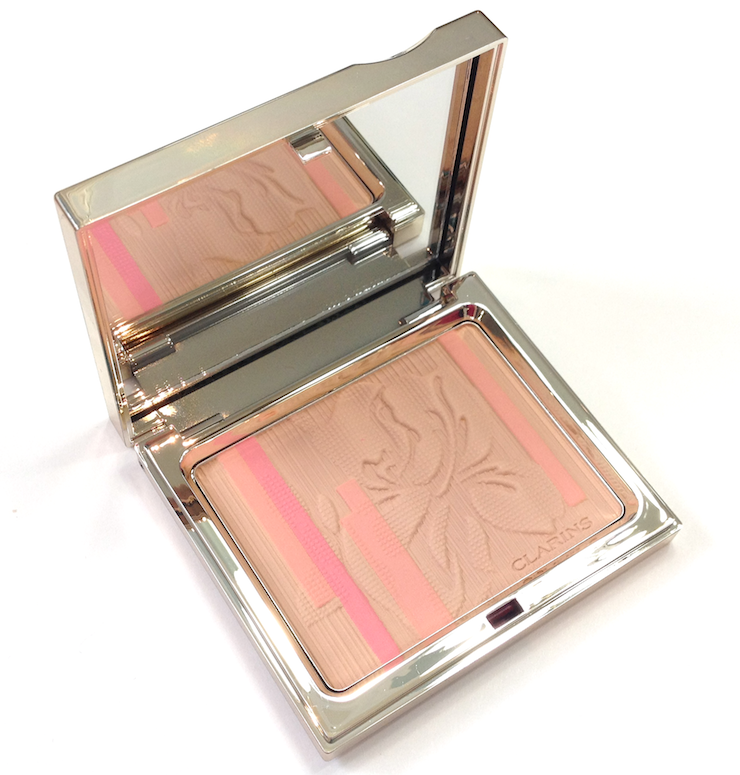 This palette has elements of both a bronzer and a blush. 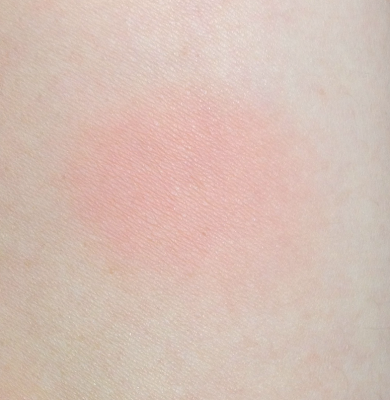 The base colour is a pale beige-y tan that is marginally deeper than my skin tone (NC 20, for reference). It is fairly neutral, but brings some warmth to my skin. 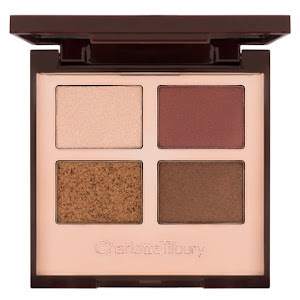 With a small highlight or contour brush I can pick up just this colour to use as bronzer or light contour, though not without some maneuvering. The other two shades are a lovely tulip pink and pinkish peach, arranged in small stripes down the sides of the compact. Don't be fooled by their small size, because they are saturated. You can't use them individually, of course, but if you focus your brush on the left side of the palette you can get a more pink-toned blush shade. Using a bigger brush over the breadth of the palette, the colour that emerges is the one in the swatch at the bottom, a soft coral-peach. The texture is incredible - super, super finely-milled, so soft and dense. 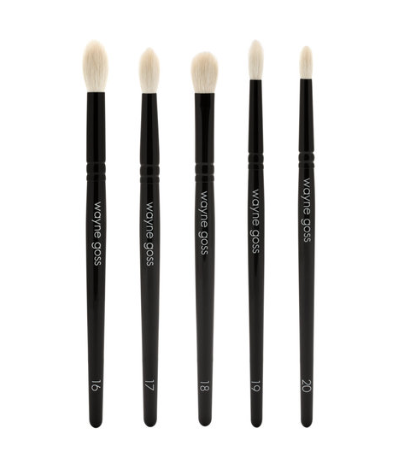 It feels creamy and smooth to the touch, and will kick up powder if you use a stiffer brush. It is not, however, powdery on the skin. It blends well, with no pigment sitting on the surface. 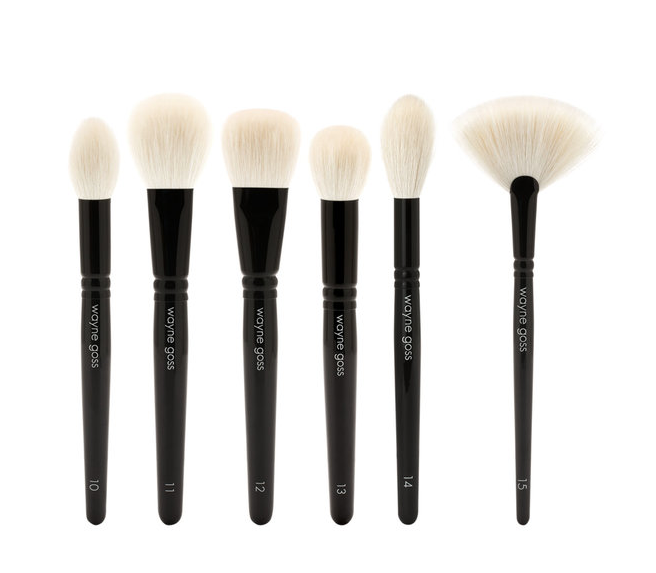 The finish is matte and holds up for 6 to 7 hours with no fading. A kitten-soft synthetic blush brush gives the best application, depositing the right amount of colour for a cheery spring cheek look. Because of the neutral tone of the base shade, this will not yield a super-intense effect - it really is meant to be subtle, warming and fresh. On deeper skin tones than mine the effect may be extremely muted or negligible. It is, however, ideal for pale-skinned redheads and blondes. Peach stripe, pink stripe, base colour. All blended together with a blush brush. Availaibility: At Pharmaprix/SDM and Murale stores, as well as Nordstrom and The Bay. Price is 40$ CAD and 35$ USD. Pros: Gorgeous texture that feels ultra-smooth and blends without a hitch. 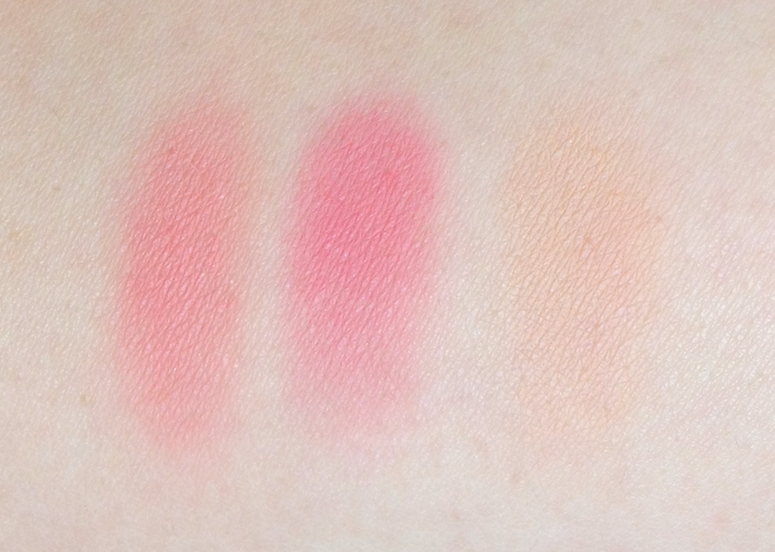 With a smaller brush, can be focused on either side to create a more pink or warm effect. Overall colour is lovely. The imprinted design is so pretty it's almost a shame to erase it with use. Cons: The delicate nature of the colour means that it has limited potential for deeper skin tones. You are correct in assuming that this won't work for deeper skintones - I checked this out and its a totally no-go for me, disappointingly. It's so gorgeous to look at and your swatches make me want it all over again! Sigh. Can't win 'em all, I guess! I can vouch that summer was twelve years ago. I'm about ready to TAKE THE BLACK. 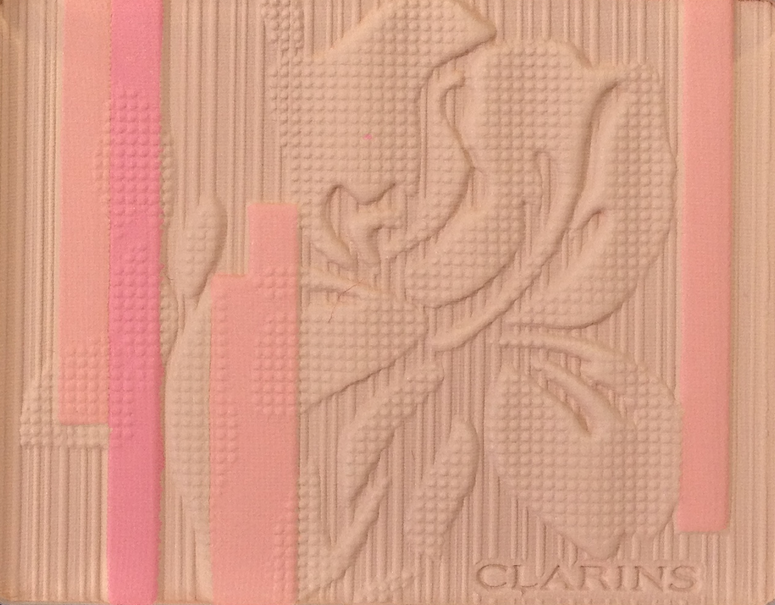 Nobody does beauty powders like Clarins. I think the shades (solo & mixed) look stunning against your skin tone. LOL! I'm all "whose head do I gotta chop off here?" IMMA DO IT. Seriously. 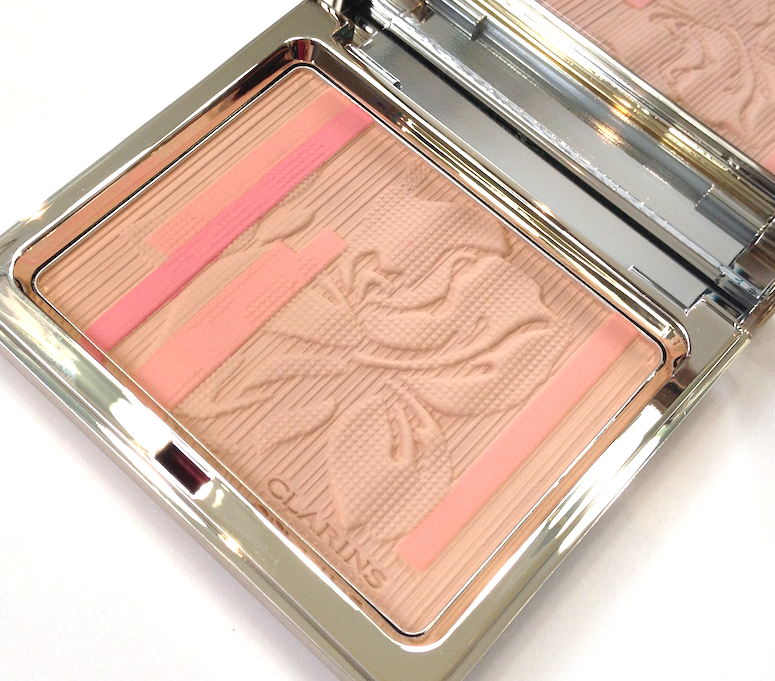 I don't think I've ever experienced a skin fail from Clarins.